Kevin Federline Actually Knows How To Write! 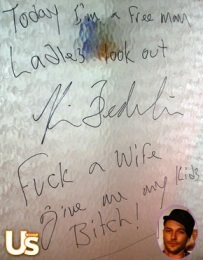 Aside from now knowing how to blackmail, Kevin Federline has learned to write — on shower doors and scratch paper. After his November 8th “performance” at the House of Blues in Chicago, and the day after Britney Spears filed for divorce, he left a little love note for his soon to be ex-wife. Sounds like somebody has been eating sour grapes. According to US Weekly, the note was really written by him, as the signature matches a poster they have in their offices. I thought only teenage girls wrote nasty notes in bathrooms. Also according to US Weekly, the final straw that led Britney to finally file for divorce was a hand written note from K-Fed sent to her hotel room on November 6th. (Wow! Kevin must be really excited about his newfound skill of writing.) Apparently the note blamed Britney for all of their problems — because as we all know, Kevin is an angel. Just hours after receiving the note, Britney called her lawyer, and signed the divorce papers right there in her hotel room. Then she visited David Letterman, sans her wedding ring. The next day, her divorce hit the wires, and the day after that Kevin took to writing on shower doors. I used to do stuff like that when I was a kid and on timeout. 48 queries in 0.643 seconds.